Today is the spectacular Indian 67th annual Republic Day parade celebration with festivals, parade that celebrates the animals, people , children, and military power of this, the world’s largest democracy. President Hollane of France was the honored guest this year. A spectacular show of the nation’s military power and cultural diversity is put up to celebrate the adoption of the constitution in 1950. 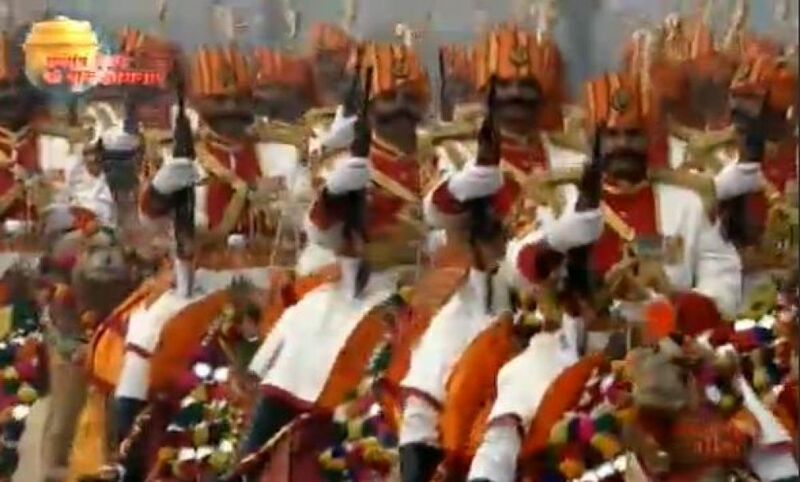 New Delhi: French President Francois Hollande is the chief guest at the Republic Day parade Tuesday, a spectacular showcase of the nation’s military power and cultural diversity to celebrate the adoption of the constitution in 1950. After a gap of 26 years the Indian army’s unsung — or unbarked — heroes are returning to the parade. 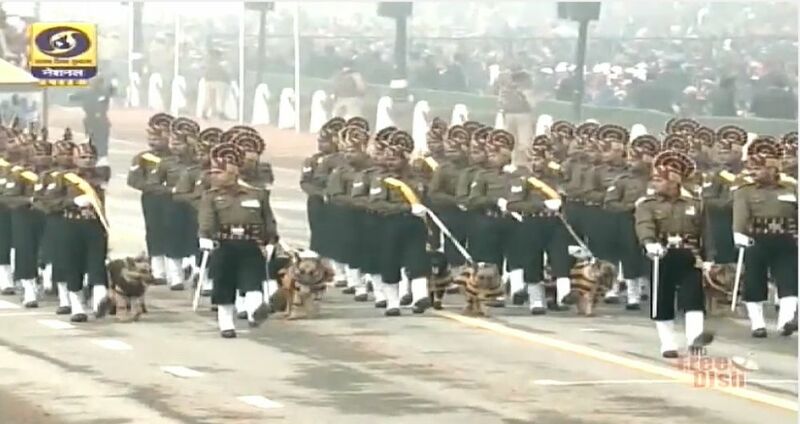 A dog squad drawn from the Army’s Remount Veterinary Corps will perform a march past wearing striped coats in their unit’s colours of maroon and gold. The Labradors and German Shepherds usually work in the restive northern region of Kashmir detecting explosives and landmines or tracking in avalanches. Reportedly just 36 dogs out of 1,200 were chosen for the big day and underwent weeks of training. French contingent marches at Rajpath. 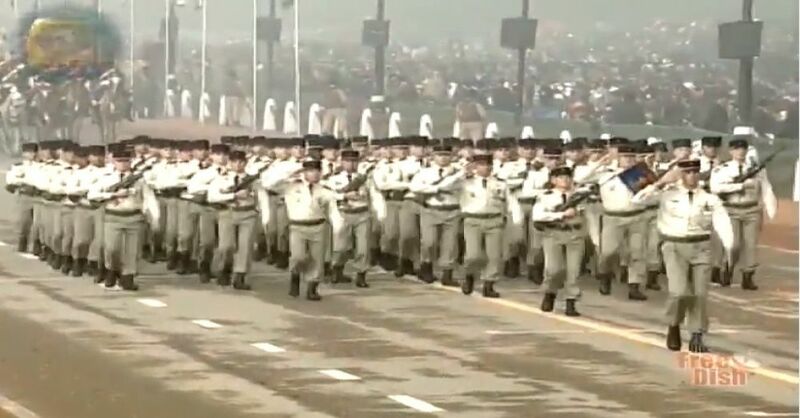 For the first time in Republic Day history foreign troops will join the celebrations as soldiers from France’s 35th Infantry Regiment, one of the country’s oldest active regiments, march alongside their Indian counterparts. It is a reciprocal gesture after Indian troops marched down Paris’s Champs d’Elysees on Bastille Day in 2009. But rehearsals haven’t gone entirely smoothly. “Indian troopers march a little faster than us. After rigorous practice for over a week, we have tried our best to synchronise,” Lieutenant Colonel Paul Bury, who is leading the contingent, told India’s Firstpost. Instead of the usual stunt men on two-wheelers — picked out as a highlight by President Obama during last year’s parade — daring female motorcyclists from the Women Daredevils Central Reserve Police Force and Rapid Action Force will for the first time show off their skills on Royal Enfields in front of the crowds at Rajpath. 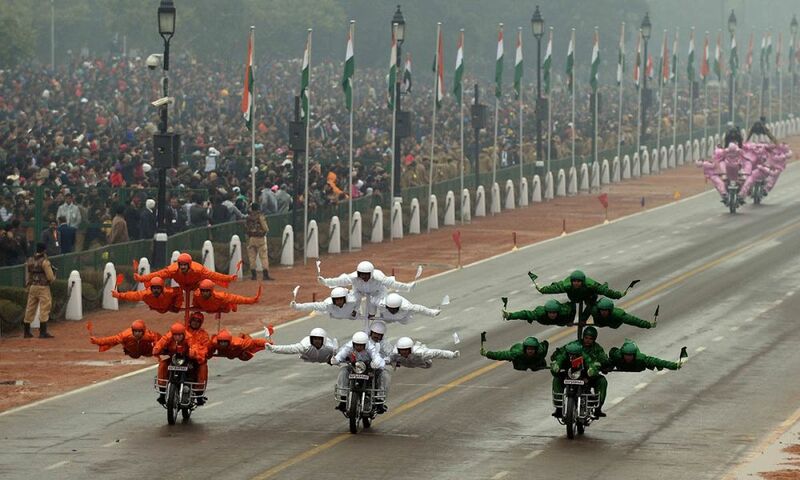 The white-and-red helmeted daredevils were seen practising their stunts — which include the human pyramid and lotus formation — near Rashtrapati Bhavan, the presidential residence. There was a small outcry after various newspapers suggested the camel contingent, usually a mainstay of the parade, may be dropped this year — but officials later reassured the public that the dromedaries would perform as normal. The camels, used to patrol the Thar Desert near the border with Pakistan, make the journey from Rajasthan every year to participate in the parade, accompanied by moustachioed border guards. They will also be seen by millions online in India in the form of a special Google Doodle showing brightly decked-out camels carrying bandsmen to mark the day. 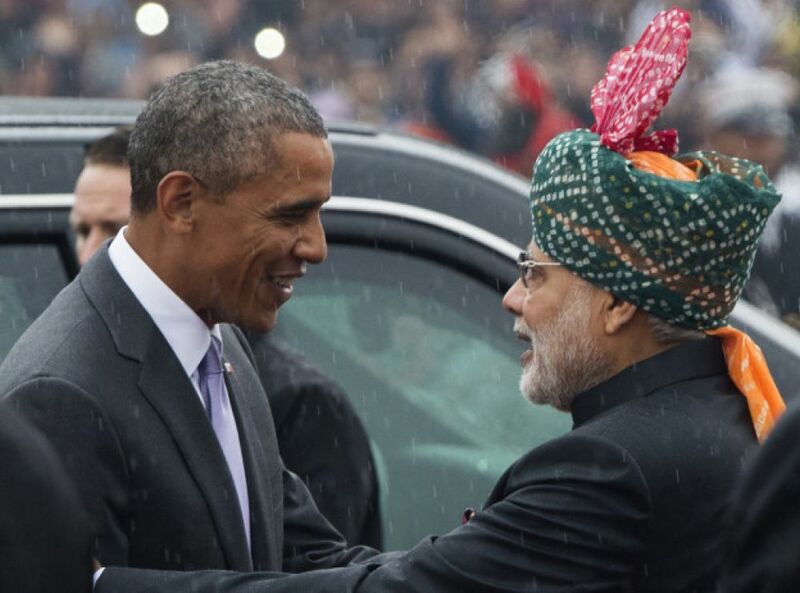 It rained on the Republic Day parade last year, forcing President Obama to take shelter under a large umbrella, in what was said to be an embarrassment for organisers. This year the VVIP enclosure — Indian shorthand for very, very important people, including Hollande and other dignitaries — will have a motorised sliding glass roof to keep them dry, according to the Indian Express. But the roof will be rolled back for the Air Force fly past — which unfurls a vapour trail in the saffron, white and green colours of the national flag — to give them a clear view of the spectacle. 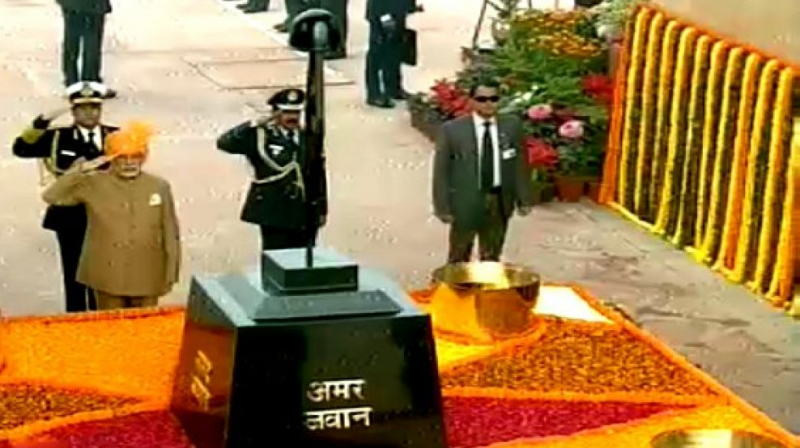 This entry was posted in Uncategorized and tagged culture, festivals, Independence Day, India, Indian cultures, Indian French friendship, Indian history, Indian military might, Indian multicultural nation, Longest Constitution, President Hollande, Prime Mindister Modi, Republic Day Celebration, world's largest democracy. Bookmark the permalink. LOL, I do so love incredible India!